I think that it is a human condition to make collections - the magpie gene - at least collections of photographs are not costing me greatly or cluttering up the house. I keep an eye for photographs to take, to add to my collections, and I update them from time to time. I have been taking photographs since the age of about 12, firstly and very unsatisfactorily on a plastic Instamatic style camera, which I took with me on an exchange visit to France. I remember photographing a bull fight, and being interested in the fact that the photographs, when they came back from processing, where mostly sand, with a tiny spec of a bull in the centre of the image - not what I had seen and experienced. I asked for a better camera, and for a birthday was given a basic rolleicord twin lens reflex - which I still have. As my enthusiasm and skill grew, I started to print my own photographs, in improvised darkrooms, either in the utility kitchen, or in the bathroom. My father was a keen photographer, and I sort of took over. In fact, my father pretty much stopped taking photographs as I started. 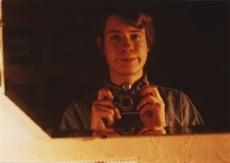 He mostly took photographs of the family, and as we where all growing up, I guess his subject matter was leaving home... As a 16 year old I borrowed one of his Leica cameras and took this self portrait.